6.3.2016: Sunil Sabharwal is re nominated by US president Barack Obama for the post of Alternate Executive Director of IMS and is re appointed. He is the first Indian American to occupy the post. He was first nominated by US president in the year 2014. He served as senior vice president of strategic investments at First Data Corporation and as board chairman of Ogone before he was appointed to this position. 6.3.2016: Srinivasan K Swamy, the Chairman and Managing Director of BBDO is conferred with The Advertising Club Madras. He was chosen for this award for his contribution to advertising field. The award was handed over to him at an even in 3rd March in Chennai. The award was given earlier to N Murali, co-chairman of The Hindu Group of publications in 1995, Narayanan in 1998 and SR Mani Aiyer in 2001. K Ranganathan also received the award in 2004. 6.3.2016: N Chandrasekaran is appointed to board of Reserve Bank of India along with two others. They are appointed as non official directors to the board. Appointments Committee of Cabinet also approved the appointed Sudhir Mankad as part time non official director. Bharat Narotam Doshi is the third to be appointed to central board of the bank. 6.3.2016: Telangana Congress former minister Ramreddy Venkat Reddy breathed his last due to cancer at the age of 72. He was elected to Telangana assembly for five times. He was the minister in the cabinets of YSR and also Kiran Kumar Reddy. He served as Horticulture minister. His death was condoled by chief minister of Telangana K Chandrasekhar Rao, PCC president Uttam Kumar Reddy, Mallu Bhatti Vikramarka and K Jana Reddy and others. He was elected to assembly from Palair in 2014 elections. 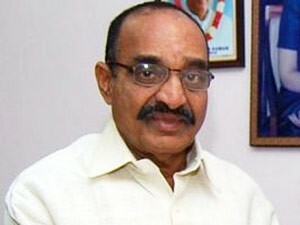 Venkat Reddy is the brother of R Damodar Reddy who was also the former minister. This entry was posted in Current Affairs, News on March 7, 2016 by Rakesh.